In this solo cooking adventure, Gary makes a meal perfect for the upcoming St. Patrick’s Day holiday. Top left – raw corned beef brisket. Top right – Samuel Smith’s Nut Brown Ale. 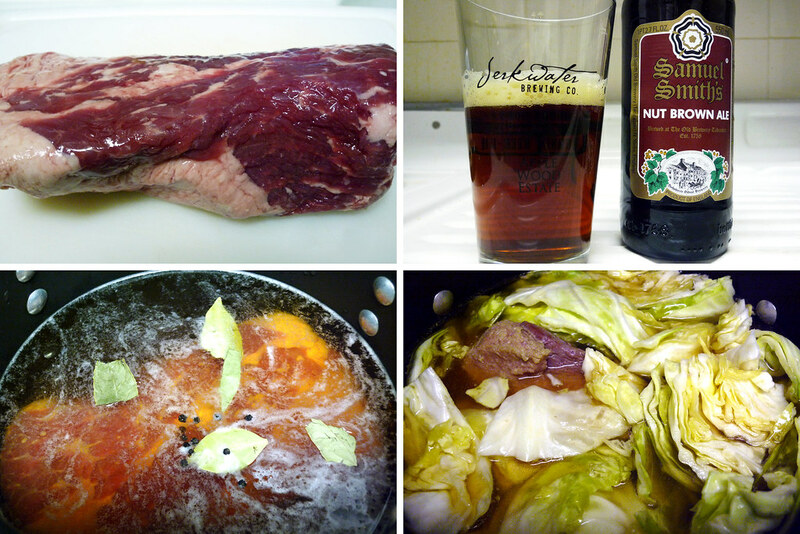 Bottom left – corned beef brisket in the cooking liquid. Bottom right – the pot after cabbage and potatoes were added. 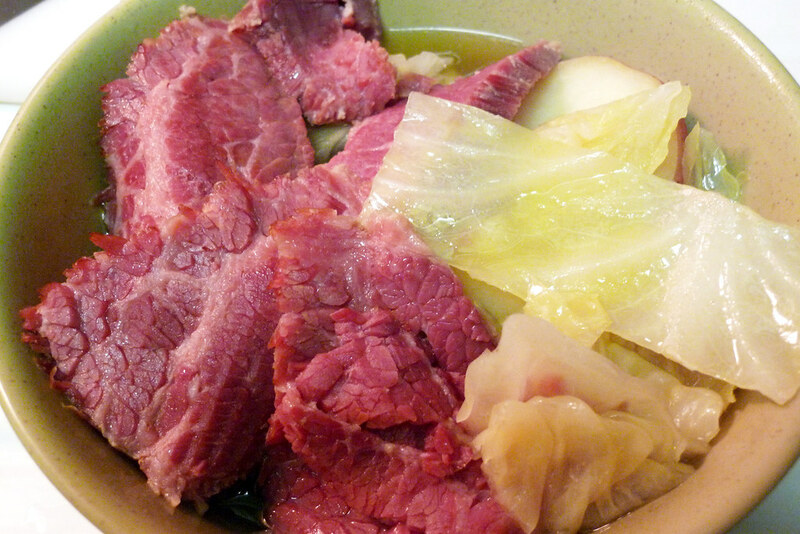 With St. Patrick’s Day only a few days away, it seems the right time to talk about that wonderful holiday treat – corned beef and cabbage. Even in my Asian-American household, my parents would serve this meal every year around this time. Is there some sort of Irish heritage that I had been unaware of? Not so much – it had more to do with the fact that the price of corned beef brisket plummets to ridiculous lows at most supermarkets in the two weeks leading up to St. Patrick’s Day. A nice three pound brisket is more than enough to feed a family of four and enough leftover for sandwiches for a few days. This year, I had lost track of how close to St. Patrick’s Day it was. Only eight days out from the holiday, I found myself in a supermarket after hitting the gym in search of some bananas and yogurt for a somewhat healthy post-workout breakfast. As I always do when going to a supermarket, I wandered toward the back to the meat aisle. There, I found thick-cut corned beef brisket at $1.99 a pound. Even better, I found a brisket that was just barely over two pounds. Any more is just a bit excessive when serving one even if leftovers are part of the plan. Corned beef brisket, after it’s been taken out of the pot. 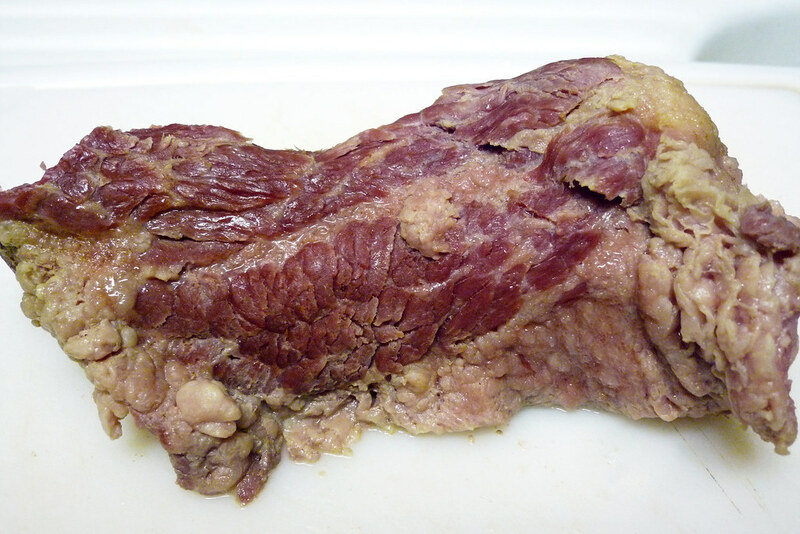 I’ve tried a number of ways to cook corned beef brisket from a number of recipes. Really, though, it’s a set it and forget it type of deal. All you really do is cook the brisket in simmer liquid and add vegetables when the meat is tender. Not exactly rocket science, is it? What I like to add to the cooking liquid is some salt, whole black peppercorns, and bay leaves just to add a little spice to the water. Most importantly, I like to add beer because beer just makes everything taste better. Specifically, I used Samuel Smith’s Nut Brown Ale but just about any dark beer will do. When it’s done cooking, all you have to do is slice up the meat, put that and the vegetables into a bowl, and add as much of the immensely flavorful cooking liquid to your liking. It takes a few hours but the effort is minimal and you have a great meal when it’s done. Corned beef and cabbage with red potatoes. Let’s talk about what you can do with the leftovers. Obviously, there’s the Reuben, a sandwich made with corned beef, sauerkraut, Swiss cheese, and Russian dressing on grilled or toasted rye bread. My favorite way of serving leftover corned beef is in a hash. Melt some butter in a skillet, add some boiled potatoes (the leftover ones from the recipe will work), maybe some chopped onions or peppers, and some chopped corned beef. Add salt and pepper to taste, then let it cook until the potatoes are browned. This makes for a great breakfast. By the way, if I had waited another week, I would have been able to get thick-cut corned beef brisket at my local supermarket for $0.99 a pound. Insane. Place the corned beef brisket in a large pot. Add beer and enough water to submerge the entire brisket. Add the salt, bay leaves, and black peppercorns. Cover pot and bring to a boil, then reduce to a simmer. Cook for two hours until the brisket is tender. Add the potatoes and cabbage, making sure to push them into the liquid. Cook until they soften (about 30 minutes). Remove the brisket. Slice the brisket against the grain. To serve, put the vegetables, meat, and as much of the cooking liquid as you want. really adopted by Irish immigrants in the U.S. In Ireland they tend to go with boiled Irish Bacon.I’m not certain, but I think the use of the beef is a German/Eastern Europe thing.I usually use a combination of stout & stock (chicken) and throw in some whole-grain mustard too. Other than that you’re dead-on perfect. Mix the cabbage with leeks and creamy mashed potatoes and you have “colcannon” (a traditional Halloween dish). Or try this: mashed parsnips & carrots, with caraway. Another well-written,entertaining and informative entry. Thanks and a Happy St. Pat’s to you Mr. O’Wong. See ya.